I speak, write, and teach about strategies for women to gain public influence and political power. My work is based on my deep experience as a women’s advocate (see more here), public official, and civic leader. Here is my speaking biography. I have been a lecturer at the University of Chicago Harris School of Public Policy. My writing on women and politics has appeared in The Huffington Post, The Hill, MSNBC, Crains Chicago Business, and Feministing, among others. At the start of their respective inaugural terms, I was among the national leaders who developed women’s issues agendas for Presidents Bill Clinton and Barack Obama. I have advised numerous celebrities, public officials, and corporate leaders and was a corporate officer and director. Here is my speaking biography. 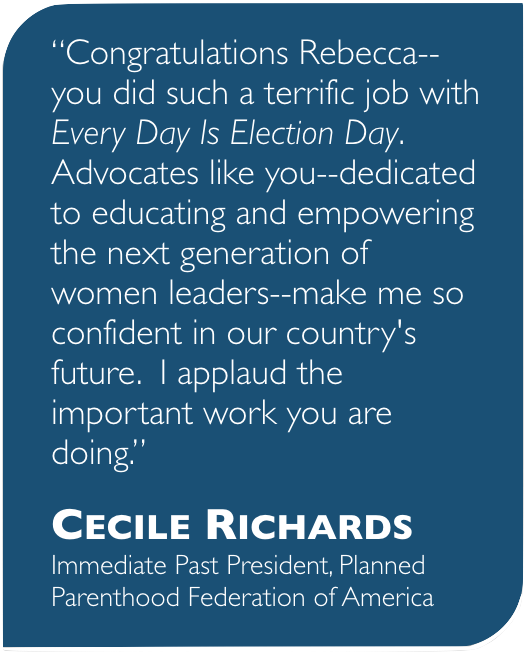 Here are favorite images from the speaking and book tour for my first book: Every Day Is Election Day: A Woman’s Guide. to Winning Any Office, from the PTA to the White House.